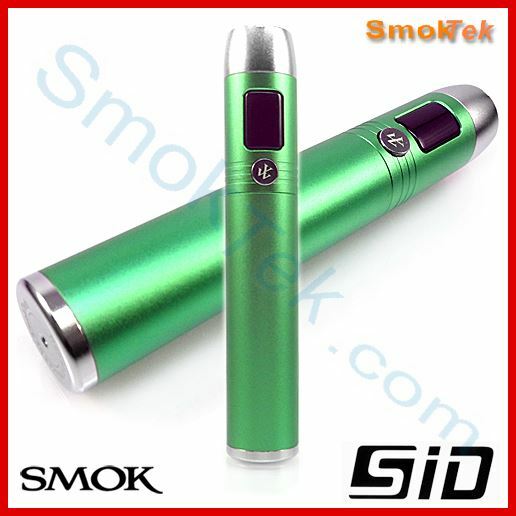 The SID Advanced Personal Vaporizer by SmokTech is sleek, powerful, lightweight, reliable, full featured and very well built. It has a newly designed OLED display, making adjustments easy to access, read and understand. 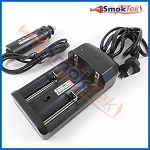 Voltage or Wattage is variable 3.0-6.0 volts or 3.0-15.0 watts respectively, using a single 18650 battery. 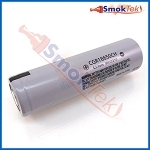 Check atomizer resistance and battery voltage too! With its 4 Amp output, it is sure to rock whatever device you want to run on it. This version has a non-lighted metal button and very easy to read 2-line OLED display, that can be turned off. It has the native 510/eGo connection with outside threading so it will run the 510/eGo-threaded Clearomizers, without adapters. Run 808 devices as well with a 510-808 adapter. 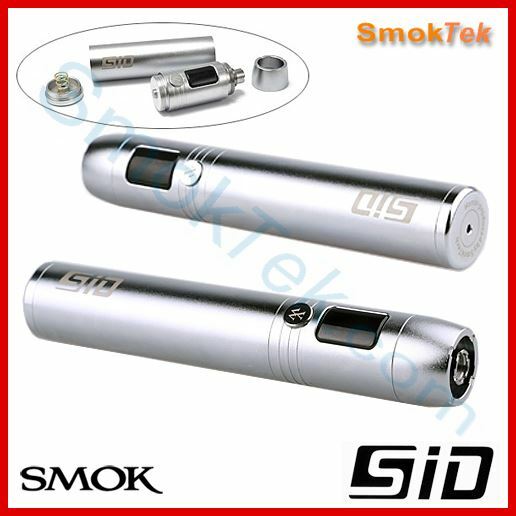 The SID requires one 18650 IMR battery (not included). 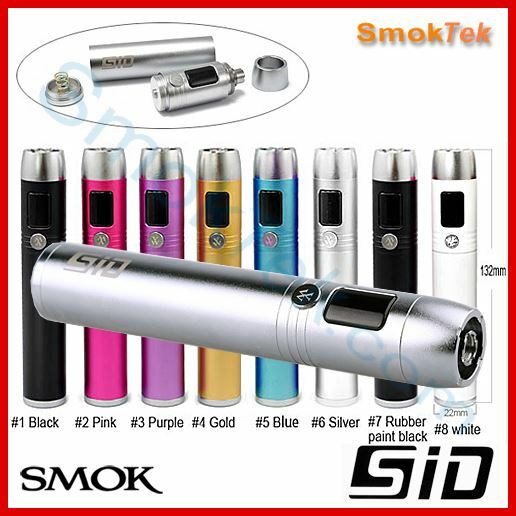 It will work with flat or button top IMR's and protected Li-Ion 18650 batteries (excluding the Efest Purple series batteries, which are too large to fit in the SID.) Using the 18500 replacement tube, you can now run an 18500 IMR battery on your SID! 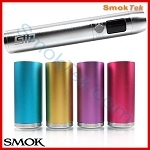 Or, for a stealthier vape, you can run an 18350 IMR battery using the 18350 tube. NOTE: This unit will NOT work with the Panasonic CGR18650CH button top because of the extra thickness caused by the overwrap. However, the flat top Panasonic CGR18650CH works perfectly! The SID has a simple 7 feature menu which is accessed by pressing the fire button 3 times. Out ON/OFF. Turn the device On or Off. 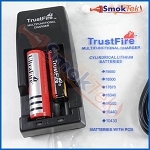 This is sold by itself, charger and batteries are available separately or at a discounted price when you select them from the Make it a Kit menu above. I've had 2 Lava tubes(the contacts wear out in a month or two and won't fire) and a mod(great on batteries but not much vapor from it) so far,and this SID is by far the best I've used.Great vapor,much better life on batteries than the others,and very user friendly.I really like this one! Fantastic device. Threading is absolutely terrible, however. It's rough and I occasionally have to clean out metal "dust" left inside the tube. That is the ONLY thing keeping this review from a perfect 5-star. Wow! What a surprising mod! I was worried about cheap feel because it’s light. Everything fits well though. The menu is large, easy and looks good but might be an issue outdoors. “batte” instead of “battery” on the meter is still an issue. Finish is lightly anodized and likely will wear. All my carts fit well, except for Smok GBC for some reason, no contact. Power is accurate and works well. 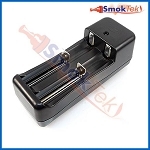 Fits Kanger T3 with ease. Beauty ring is removable-it does look and feel cheap. 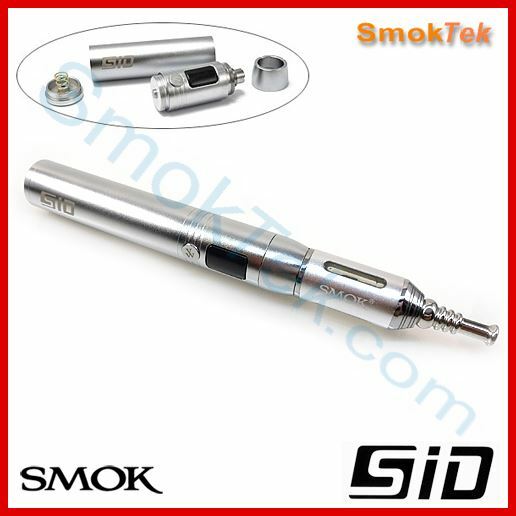 Has ego outer threads and standard 510 threads. Tube threads are rough, yet fit well. Good “positive click” button (so far). As a $30-$40 mod, it’d be 5 stars. As a $55+ mod, it’s at the lower end. I am happy with it in spite of the annoyances. Glad I took a chance and got the SID. I love it. Must make sure you get the right batteriess. Lasts a long time. I'm so happy I got my SID. Absolutely trustworthy, solid construction, and gives the best vaping experience by far of anything I've tried for a reasonable price. I use it every day, all day. I got the silver finish and it still looks like new, but sometimes I notice a slight metallic smell, but that's not affecting performance. The other coating finishes probably don't smell metallic. Overall,I am very happy and I would recommend it to everyone. put the battery in and it is on. no 5 click. cool. quick menu. seems to give accurate power. nice curved screen. put in pocket for long walk and finish rubbed of in perfect circle. no biggie. else 5 stars.